We had a wonderful stay as a group of friends, the villa is absolutely beautiful and so well looked after. It has everything you need from the pool, to the outdoor bar/bbq area and the kitchen, bathroom and bedrooms made it feel like home from home. As a large group the outdoor living spaces were perfect for us to have food and drinks in the evening, we couldn’t have asked for better. A car is definitely recommended to get to the local shops and area but there’s plenty of space for parking too and a really secure front gate. We are already looking at our next visit! This villa is very impressive! Pretty much everything it says it ways! I was in a large group of guys & found the sleeping arrangements pretty hard! My group found it very hard for taxi & our transfer from the airport very hard to find the address absolutely nobody knew where villa was. I wouldn’t take anything away from this villa as it was immaculately clean inside & out. If I was going back to mijas I’d definitely have no hesitation of staying here again. We holidayed with our family, 6 adults and 4 young children in this beautiful villa, which was just perfect for our needs. The family met us at the villa and could not have been more welcoming. Carmen, the owners niece, speaks English which was a great help and gave us her mobile number as a contact, she was very sweet & did help us with taxis, directions etc Thank you Carmen ! 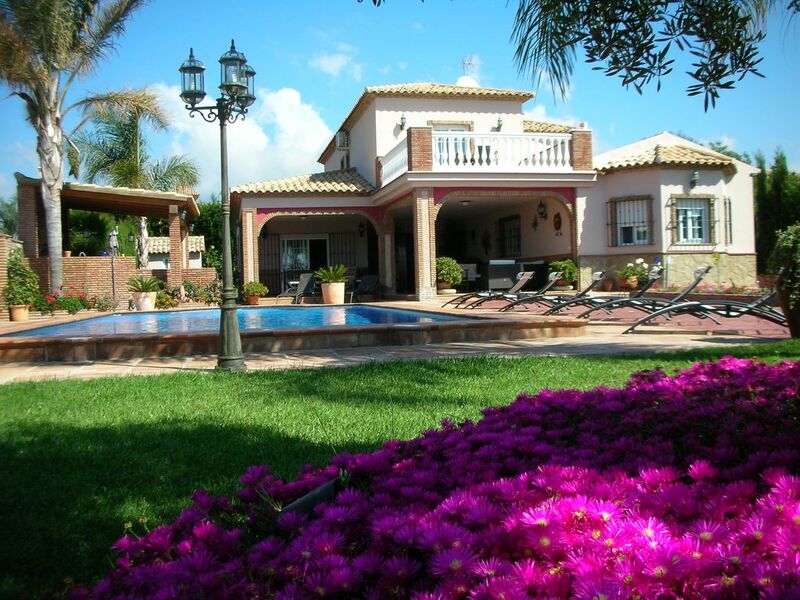 The villa sits central to its plot behind a large electric gate with beautifully manicured level & completely secure gardens complete with stylish outside toilet and shower. The pool is a very good size and spotlessly clean with alarm (the owner has grandchildren and had this put in for her peace of mind when they visit) again perfect for our needs, along with the toys which were made readily available for the children to play with. When we stayed the weather was exceptionally hot, but the villa offers plenty of spacious solid shade overlooking the pool & gardens with comfy garden furniture & huge dining table. What is not mentioned in the villa write up is the outside kitchen/BBQ/bar area! It was fantastic & such fun! it is fully equipped with fridge/freezer, sink, dishwasher, induction hob & large grill with an abundance of pots, pans, plates, glasses just perfect for alfresco living, the guys were only too happy to cook. The villa offers 6 bedrooms, 4 on the first floor & 2 ground floor rooms, 2 indoor shower rooms & a full bathroom a fully equipped kitchen, large utility, stunning lounge/dining room all very tastefully presented. To sum up, we had a fantastic time and were very sad to leave, but will look forward to returning ! NB: Car hire is essential. Mijas pueblo approx 10 mins drive. Supermarket 4/5 mins drive. Beach approx 10 mins drive This was not a problem for us, secure, shaded parking for 3 vehicles. Thanks for all ! It's beautiful ! Thanks a lot !!! I hope I received you again ! The owners are really friendly and the house is just marvelous and perfect for families with children. There is enormeous space in the house and garden inclduing nice pool and the acces for shopping, the sea or main roads to visit other villages are very convenient too ! The only inconvenience was first the loud noices and the barking from crazy doogs around the house. But even here the owners arranged to make them leave ??? Important to know is also the fact that all phone numbers from the owners are needed to be conntacted via France and not Spain (means +33 and not +34)which was not told to us and had some problems in the beginning to let them know about our arrival. But afterwards they very gentely contacted us every three days to see if everything was good and fine. We would recommend to to get a local number and to fix and arrival time at the house and presence from a local person. But overall it has been a wonderul stay which we can highly recommend to everyone. We have just spend 11 days of vacation at this beautifull house. We can only give our best recommendation. The house is self is beautifull and with plenty of space. All pictures are 100% true to reality. The garden and pool area is stunning. We spend many days at the pool side and were enjoying the open kitchen/bar area during day and evening. The communication with the owner went seemless and was very friendly. Handover of keys and communication during our stay was excellent. I can only give this house my very best recommendations and we would love to return again.